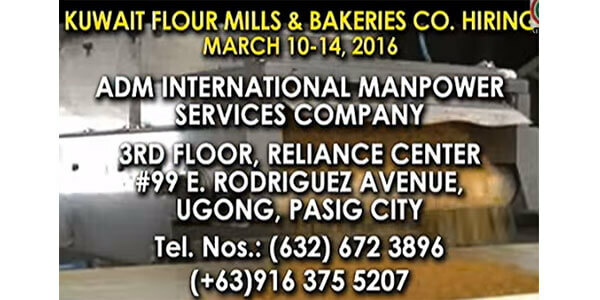 Flour Mills and Bakeries Company is in need of 240 Pinoy workers for the different department based in Kuwait. Interested applicants must undergo an initial screening by KMFB recruitment team starting on March 10 to 14, 2016. Besides of the good and high salary. Home and the transportation of the workers are free as well as food allowances. “We’re always looking for talents, the Filipinos they are creative they are loyal to their work and they're very organized.” Yousef Fahad Al Sharqawi – Asst. Master Baker, Kuwait Flour Mills & Bakeries said. Here are some the information you need to know. ADM International Manpower Services Company located at 3rd floor, Reliance Center #99 E Rodriguez Avenue, Ugong, Pasig City, Philippines. Contact Number: Tel nos.. (632) 672 - 3896 , Cel nos.. (+63) 916 375 5207.